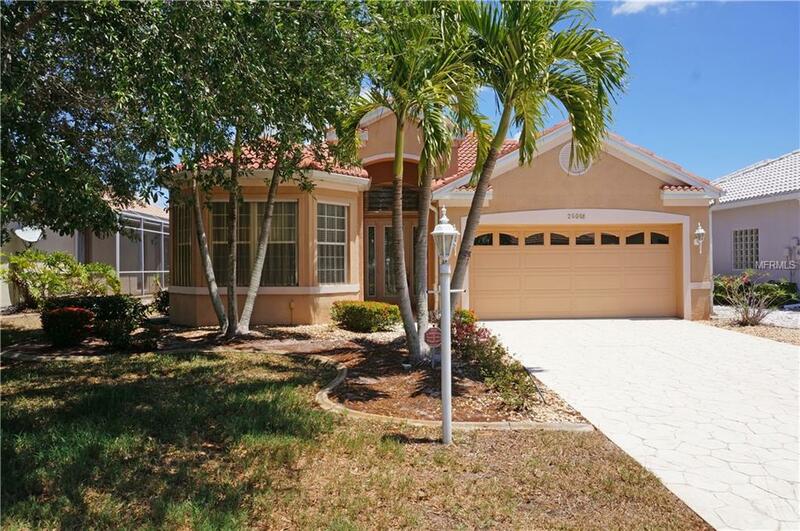 Impressive 3 Bedroom, 2 Bathroom home with attached 2 Car Garage located in the desirable gated deed restricted community of SEMINOLE LAKES. Fabulous VIEW OF THE GOLF COURSE 5TH GREEN AND LARGE LAKE. This spacious home offers an open and split bedroom floor plan with Great Room, separate Dining area, Inside Laundry, well appointed Kitchen and large screened Lanai. The pretty white Kitchen offers a breakfast bar, built in desk, solid surface counters, dining area. The Inside Laundry has a washer, dryer, sink, counter space for folding. The large Master Bedroom suite features lanai access, TWO walk in closets, dual sinks, walk in shower and garden tub. There are two additional bedrooms and the third bedroom with pocket center closing doors is currently used as a den. The guest bathroom has a tub/shower combo. The monthly fee is only $120/ month and includes lawn care. Other features include hurricane shutters, intercom system, security system, ceiling fans, plant shelves, sliding glass doors. **Furniture is negotiable** Seminole Lakes is a golf community with community pool, 18 hole executive golf course, fitness facility, tennis courts, pickleball, clubhouse, 24 hour security and more. Low HOA fee includes yard care and amenities. Seminole Lakes is located minutes from historic downtown Punta Gorda shopping, dining, medical care, waterfront parks, fishing piers, boat ramps, art galleries,events and more!